I suppose you thought that everyone was finished with material about the Reformation. We had the 500th anniversary of what is considered the beginning of the whole thing, where Martin Luther put out his 95 theses on what was the social media of his day. The Reformation continued developing and theology was being refined. Newer Reformers appeared on the scene, and not all were in agreement. Sincere, thinking people will disagree (just like not all biblical creationists are in lockstep). Ulrich Zwingly is often tacked on as an afterthought to Christian history, which is unfortunate. He upheld the authority of Scripture and was in trouble for disputing Papal decrees. This was not just a dispute over religion, but was a threat to governmental authority at the time. One reason I delayed posting this was to make an emphasis about how Zwingly is neglected. [S]trangely, one of the leaders of the Reformation, often called the “Third Man of the Reformation” (behind Luther and Calvin) is often omitted. That man was Ulrich Zwingli (sometimes spelled Huldrych Zwingli). Due to his death early in the Reformation, he seems to have been largely forgotten or relegated to passing mentions in books covering this time period. This is unfortunate, as Zwingli had (and still has) a profound effect on Protestant theology. The Reformers’ aim was to point people back to the authority of Scripture, to encourage the translation of the Bible in the common tongue of the people, and to reject any tradition or man-made teaching that contradicted Scripture. Zwingli was passionate for these principles. 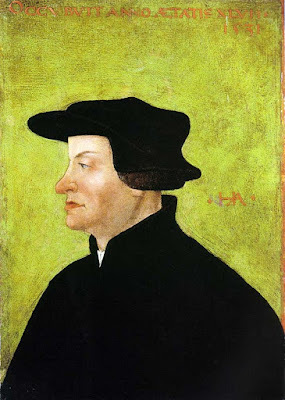 To read the article in its entirety, click on "The Forgotten Reformer—Ulrich Zwingli".